A Chesterfield yard is redesigned fro optimal outdoor living. It’s shaping up to be a great summer at Andy and Anita Higginbotham’s Chesterfield home, where warm days are spent in the new pool, meals prepared in the outdoor kitchen are served on the enlarged patio, and balmy evenings on the screened porch feature the soothing sounds of the backyard’s two water features. 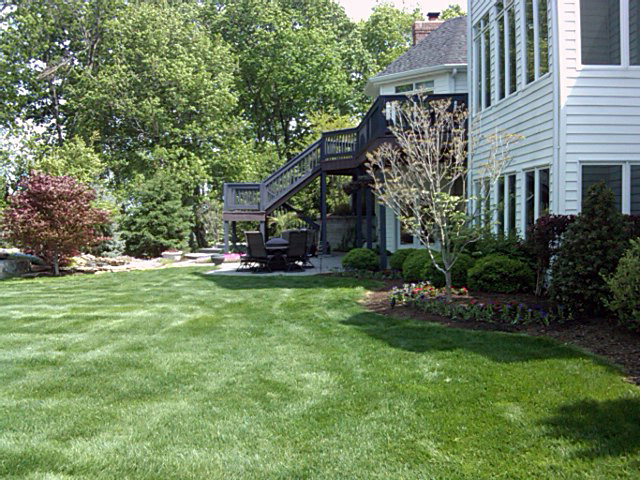 Last summer wasn’t as fun, with the yard becoming a construction site in June. “We just didn’t have a backyard, and it was tough to give that up,” Anita says. But it was worth it: After a few months, the backyard’s wide, green lawn had been transformed into a stunning multi-use space designed to make the most of outdoor living. The project finished up in September—too late to enjoy the new pool for long, but just in time to spend crisp fall evenings around the new outdoor fireplace. 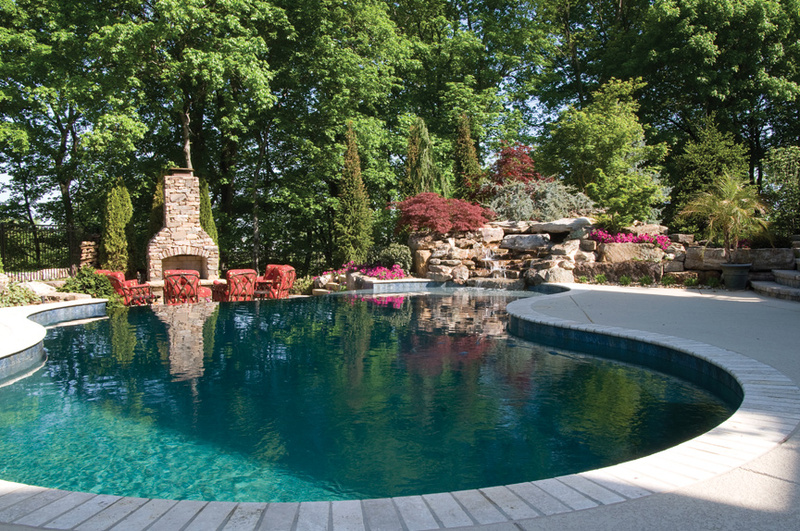 The Higginbotham’s design began with the pool, the largest piece. Once that was placed, other elements took shape: enlarging the patio, adding the kitchen and fireplace area, moving a pond and adding another. The plan carefully considered multiple factors, such as placement and use, with extra care taken to ensure that the space is good for the family’s frequent entertaining by providing adequate room on the patio and around the pool. 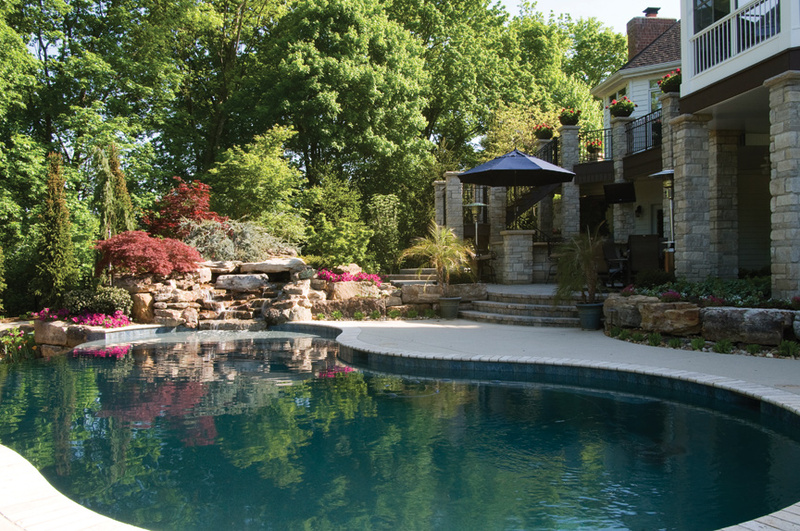 Jim also carefully considered sightlines—the pool, for example, offers the sleek line of an infinity edge from one side and from the other, a cascading waterfall featuring natural stone. Several existing elements were also enhanced to make the yard cohesive, using the same materials as the new features: deck supports made into stone pillars, new wrought-iron railings, and a new screened porch. “It blends so much better than before,” Anita says. The result is a backyard that features distinct areas that retain a sense of their own space yet are connected well enough to form a whole. “It’s kind of like a house,” Jim says. “You make sure one area doesn’t disrupt another.” He noted that there are multiple ways to create boundaries that provide a sense of defined space, such as varied elevations, using differing building materials or placement of plants, such as a flowering tree or a cluster of evergreens. Creating unity in the outdoor space wasn’t that much different than doing a house’s décor either, where harmonious materials provide cohesiveness and pops of contrast, texture and color add interest. Materials and plants worked together in color or seasonality, yet differences in texture added interest. The fireplace’s weathered fieldstone and the weathered sandstone near the pool, for example, are of the same family, while the Aux Vases Old World tumbled stone in the pillars provides contrast.